You’re probably well aware of Old Whitey, the trusty war mount belonging to President Zachary Taylor. But have you ever heard that he also had a former circus pony? Through research, the Presidential Pet Museum has recently uncovered new details. 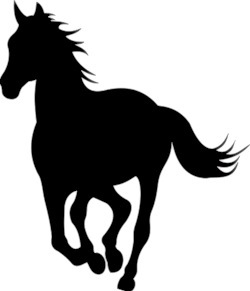 A doctor named Simon Pollak told the St. Louis Globe-Democrat that he had given Taylor a black pony some time before the general became president. “When President Taylor was inaugurated, Apollo went to Washington along with Old Whitey…and, I think, died there,” the newspaper quoted Dr. Pollak as saying (many years later in 1898). And how did Apollo come to be in Zachary Taylor’s possession? Taylor’s daughter wanted the pony. And it seems that what Taylor’s daughter wanted, she got. That’s all we’ve been able to uncover so far about the mysterious Apollo.